Olive Tree Genealogy Blog: Are You My Grandfather? 9th Edition of Smile For The Camera: Who Are You - I Really Want To Know? Are you my grandfather who died before I was born? I know this picture was taken in Guelph Ontario circa early 1930s. I know that the two individuals in the front, on the left are my Uncles Roy McGinnis and Joe McGinnis. Joe was born in Guelph in 1925 so that helps date the photo slightly. I don't know who the man on the far right (front) is. 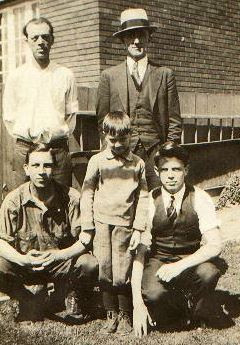 I think the man standing on the left in the back might be my grandfather McGinnis who died in Guelph in 1937 and who I never knew! I think the man on the right wearing the hat might be his brother Henry McGinnis. Does anyone recognize these 3 individuals? Almost a Dozen Boxes of Life, Where do I Begin? Where are you, Elizabeth Shuart Jamieson?